Today, Spruce Meadows victory was captured by Luciana Diniz (POR) out of a 63-horses starters under the clock tower in the ‘Masters’ opening event, the TELUS Cup. Clear rounds were rare out of the large world class roster, with only ten returning for a fantastic afternoon jump off. Course Designer Leopoldo Palacios(VEN) set the challenging TELUS Cup course which set the early standard for what is sure to be an impressive week of top sport. Following just fractions behind the winning jump off time at 39.69 seconds, was Canadian great Eric Lamaze aboard the impressive Oldenburg Gelding, Chacco Kid. 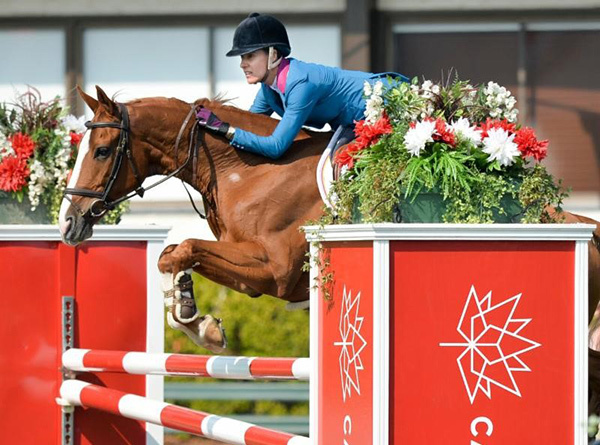 Eric qualified two horses into the TELUS Cup jump off, both horses looked to be in fantastic form for this week’s events, though Lamaze opted not to take his second mount, the lovely 14-year-old mare Fine Lady, into the final round against the clock. After producing such great results during the 2017 Spruce Meadows Summer Series, Sameh El Dahan (EGY), arrived to fantastic podium finish in the TELUS Cup with the 10-year-old Dutch Warmblood WKD Diva. El Dahan was the third of four faultless score cards, also arriving just a hair behind first and second place finishers.